Blaer is the servant who wants the prince, but when her dreams of marrying for love are dashed, she runs away. She only means to go to the next town, but is chased into the forest. After being rescued, captured, imprisoned, slapped, threatened, and kept under close watch, Blaer must find out who she truly is and what she is really capable of to save those she loves. 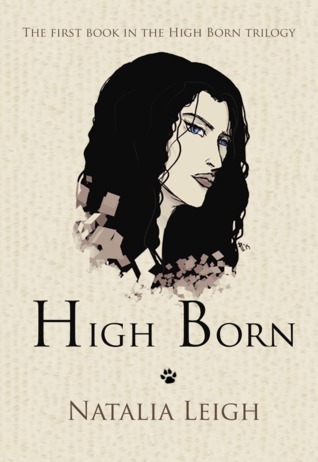 Blaer is a character that blossoms in High Born. She starts out as that whiny pathetic female character archetype who can hardly think on her own, let alone help herself out in times of trouble. She was on her way to being a static character and I was puzzled that she was chosen as the main character, that she was somehow “special.” It is her very uniqueness that pulls her out of her character rut and into a more dynamic and take-control person. Slowly, so slowly, she changes. That is, in fact, more realistic. If in real life people don’t change suddenly from weaklings needing to be rescued into heroes and heroines, neither should characters in books. Leigh gives us a complete character, one with misgivings and timidity, one who learns to accept who she is and what she must do, and becomes our perfect plucky heroine. I was surprised at the oxymoron presented in this novel, that it was said Dominic was a stickler for traditions, but his actions did not support this statement. If Dominic were such a stickler with tradition, why would he deign to talk to the servant Blair? What is tradition in this world? I was left wanting for more description of time and place. The specific settings were very much developed, but the overall context of the world that they lived in was left unnaturally blank. How am I to know what “traditional” truly is if I cannot peg the time period? The dialogue does not suggest medieval or renaissance, although the use of kings, queens and servants, does. In my mind I rectified this because I thought of this novel as taking place in an alternate reality similar to our own. And that is what I love about Young Adult as a genre. It is approachable and understandable for such a wide audience. The dialogue is similar to our own. The characters and their problems are similar to us and our own. When Leigh adds the fantasy element, voile, a book is born. I didn’t care for a lot of Blaer’s personality before she blossomed. She was kind of dense and pathetic as a person. If I can guess the caveats in the book when it is written in first person, she should too, or at least make guesses hereslf, but they go over her head entirely until a big reveal. She should have been able to guess or even know who Rowan’s father was, who the wolves at the bottom of the trees were. If “The makings of a great leader were in my blood.” (Location 4043), she should have been able to make these simple deductions. I was worried when Leigh introduced her main fantastical element, because of its previous cliched use in literature. I didn’t have to worry. Other than the too serious label for the magical element: lycanthrope, I was not disappointed in the author’s use of the concept of animal transformation/werewolves. I rather enjoyed the author’s subtle, perhaps even unintentional, minor character role reversal. It was a play on the traditional and the cliché. The mother held the role of the father and gave away her daughter’s hand for the good of the girl. This tradition is usually reserved for the girl’s father, going against her wishes and desires to give her a better life. The relationship between Blaer and Dominic was also akin to role reversal. Dominic had the very small role usually reserved for the wench the main character (a la a man) falls in love with and who has no personality. I recommend this book for anyone who enjoys a story with a female main character or a fantasy story with animal transformations. This novel was published through CreateSpace Independent Publishing Platform August 14, 2014 and is available on Amazon here.